The United States Under-18 Men's Select Team will look to secure a spot in the Hlinka Gretzky Cup championship game when it takes on Canada tonight at 7 p.m. MT (9 p.m. ET). The game will be played at Rogers Arena in Edmonton, Alberta, and broadcasted live on NHL Network (U.S.) and TSN (Canada). Team USA is 0-2 (W-L) over the last five years against Canada at the Hlinka Tournament. The teams last met in the 2014 semifinals when Canada defeated the U.S. and proceeded to win the tournament. 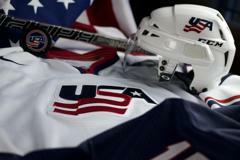 Team USA went on to defeat Sweden 3-2 in its final game of the tournament to take home third place. The rival countries also met the year prior, in 2013, with Canada defeating the U.S. in the championship game. Trailing 3-0 after one period, Robert Mastrosimone (East Islip, N.Y.) started the rally for Team USA two minutes into the sec ond. The Chicago Steel forward caught a long stretch pass from Mitchell Miller (Sylvania, Ohio) and scored his team-leading third goal of the tournament after a smooth toe drag to elude Russiaâs lone defender. The U.S. struck again just 68 seconds later on the power play, when Arthur Kaliyev (Delray Beach, Fla.) whacked home a rebound of his first shot after a centering pass from Michael Mancinelli (Northville, Mich.) to make it 3-2. Sam Colangelo (Stoneham, Mass.) produced the equalizer at 8:33, redirecting a power-play blast from defenseman Luke Reid (Geneva, Ill.) past Russian goaltender Yaroslav Askarov to make it 3-3. But Russia answered with its own power-play goal from Vasili Podkolzin at 17:33 to regain the lead, and four more Russian goals in the third period put the game out of reach. The U .S. Under-18 Men's Select Team has three skaters with three points and four with four through three games at the 2018 Hlinka Gretzky Cup. Captain John Farinacci (Chatham, N.J.) (1G, 2A), Jackson Jutting (Savage, Minn.) (2G, 1A) and Miller (0G, 3A) have all recorded three points over the first three games of the tournament. Meanwhile, Josh Nodler (Oak Park, Mich.) (0G, 4A), Mastrosimone (3G, 1A), Grant Silianoff (Edina, Minn.) (1G, 3A) and Luke Toporowski (Bettendorf, Iowa) (3G, 1A) have each recorded four points through the team's first three games. The last time Team USA played in a Hlinka Cup semifinal (2016), it defeated the Russians 4-3 in overtime. Michael Pastujov (Bradenton, Fla.), now at the University of Michigan, scored the game-winning goal for Team USA in overtime. The U.S. has made it to the semifinals of the tournament in three of the last five years. 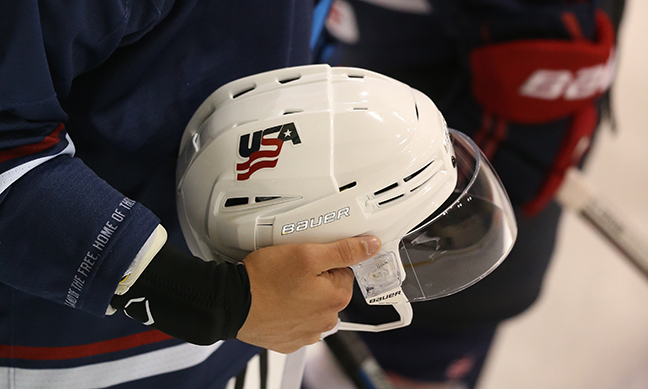 Several members of the U.S. team have experience as teammates with numerous youth hockey organizations across the country. Toporowski (Bettendorf, Iowa) and Dylan Davies (Traverse City, Mich.) were teammates with the Chicago Mission, while Nodler, Mitchell Miller (Sylvania, Ohio) and Michael Mancinelli (Northville, Mich.) skated together with HoneyBaked Hockey Club in suburban Detroit. Sam Colangelo (Stoneham, Mass.) and Cade Webber (Meadville, Pa.) joined forces in Boston with the Little Bruins while John Farinacci (Chatham, N.J.) and Derek Mullahy (Scituate, Mass.) spent time together at Dexter School in Brookline, Massachusetts. Several skaters have also crossed paths at Shattuck-St. Mary's Prep School in Minnesota, including Far inacci, Mastrosimone, Mullahy, Silianoff and Jackson LaCombe (Chaska, Minn.). LaCombe also spent time with Wolf as a member of the Los Angeles Jr. Kings, a USA Hockey Model Association. Â©2018 Team USA Hockey / SportsEngine. All Rights Reserved.